The body of Minister for Tourism and Civil Aviation Rabindra Adhikari, who died in a chopper crash at Pathibhara in Taplejung on Wednesday, will be kept at Tundikhel in Kathmandu for final tributes on Friday. The condolence assembly was put off for Friday due to the delays in carrying out post-mortem. According to the Secretariat of Nepal Communist Party Co-Chairman Pushpa Kamal Dahal, the body of Adhikari, who was also the central member of the Nepal Communist Party, will be kept at Tundikhel from 8 am to 11 am for last respects as it took more time to carry out post-mortem. The remains of the seven people killed in the chopper crash were brought to Kathmandu early on Thursday morning. The bodies were then taken to Tribhuvan University Teaching Hospital, Maharajgunj, for post-mortem and identification. The Air Dynasty helicopter that was carrying seven persons, including Tourism and Civil Aviation Minister Rabindra Adhikari, crashed shortly after takeoff on Wednesday afternoon. Along with Minister Adhikari, prominent tourism entrepreneur Ang Tshiring Sherpa, managing director of Yeti Airlines; Birendra Prasad Shrestha, deputy director general of Civil Aviation Authority of Nepal (CAAN); Dhurba Bhochhibhoya, deputy director of CAAN; Yubaraj Dahal, a personal aide to Prime Minister KP Sharma Oli, and Arjun Kumar Ghimire, a Nepal Army official, died in the crash. 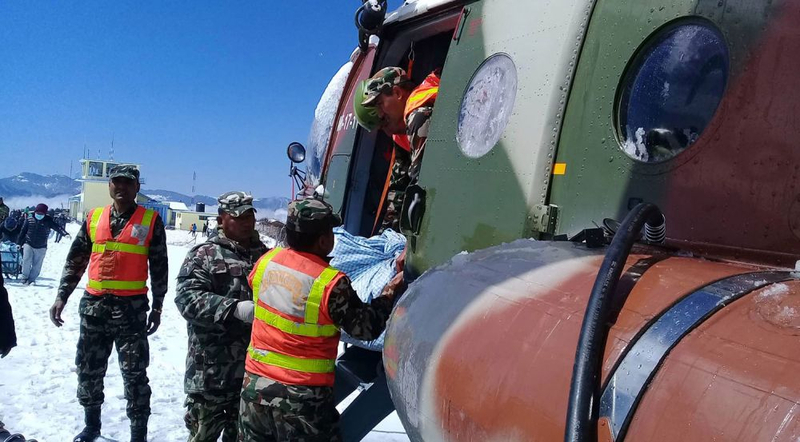 The bodies, all of which have been reported completely burnt, were flown to Suketar Airport in Taplejung early on Thursday morning. Weather conditions at Suketar Airport had deteriorated with snowfall since early morning. As the weather improved in the afternoon, the bodies were flown to Kathmandu in a Nepal Army chopper. The chopper landed at Tribhuvan International Airport at around 1:25 pm. Family sources said the body of Tourism Minister Rabindra Adhikari will be taken to his hometown in Kaski for the final rites.